Chicago, IL…Gene & Jude’s is a popular and iconic hot dog stand on River Road in River Grove, Illinois, founded in 1946 by friends and Chicago city workers Gene Mormino and Jude DeSantis. 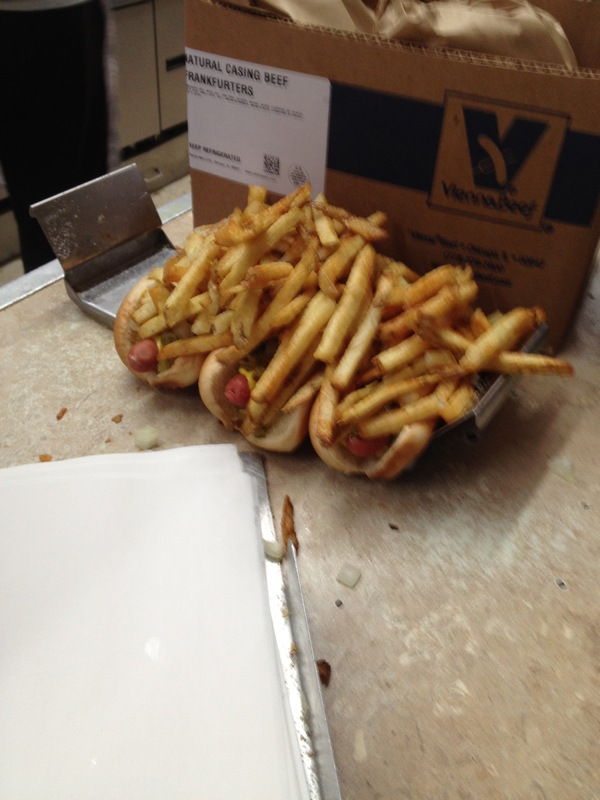 The stand is famous for its narrow approach to the Chicago-style hot dog, its toppings departing from tradition by including only mustard, onions, relish, sport peppers and fresh cut French fries placed on top, known as a Depression Dog. The menu is limited to hot dogs, double dogs, tamales and fries, and, typical of Chicago hot dog, lacks any trace of ketchup. 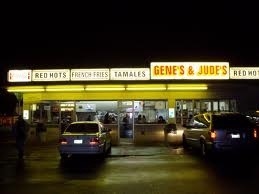 In 2006, Gene’s & Jude’s was inducted into the Vienna Beef Hot Dog Hall of Fame. In 2011, in a competition of 64 hot dog stands across the country, it was chosen by the magazine “Every Day with Rachel Ray” and the food blog Serious Eats as the best hot dog in America. I grew up with these infamous dogs close to my home in Elmwood Park and always need to get my “fix” when in Chicago! « Older Post Warm & Toasty! » Newer Post A Delicious Find! Those hotdogs look really tasty! Richard, next trip do Al’s Beef and Italian Ice on Taylor St!